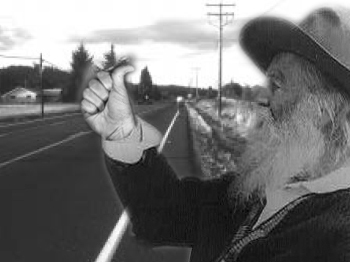 A Sub-Literate, Sorrowful Not-Walt-Whitman Hitching – You Do Hoodoo? I missed a bus in Baltimore, and with no place to stay, restless, desperate, running low, I thought I’d try to hitch a ride. I should have known. Ain’t no decent man gonna pick up a hoary-headed hobo nowadays. I stood on the shoulder, stuck out my thumb, squinting down the highway through the afternoon exhaust, hoping that some good Samaritan might stop. Eight hours later, round about one or so, a jacked-up pick-up pulled over, one of them monster pick-ups, black, four-door, with a stunted back seat of sorts. I slung my bag into the bed, climbed my way way up, and slammed the door. The passenger rolled up his window, the driver grabbed the wheel, put the pedal to the metal, war-hooped a holler, laid some rubber, and we was on our way. The two of them wore their baseball caps backwards, nothing but kids, white, maybe twenty or so, but right off I could see their eyes lacked light, like they was lost. (And I could’ve been sleeping in that depot waiting for the morrow). I told them I was bust broke, that if I had me some money, I wouldn’t be standing on the side of a highway at one a.m. in the morning. The passenger punched me in the chest, slapped my face, and while I was wallowing, jacked my wallet. The driver pulled over, hopped out, slung me to the ground, climbed back in, then drove off with my bag in the back rattling around in the bed of the truck. That was a month ago. I’m back in Mayo now writing these so-called adventures on scraps of paper. I keep them on my person, in the pocket where my wallet used to be, so on the day they find me dead, they’ll know a bit about me. This entry was posted in poetry and tagged hitchkicking, Walt Whitman. Bookmark the permalink. This is wonderful, but isn’t it “pedal to the metal”? I need to hire you as my editor, Susan. Thanks!